You might think my partner and dear friend Jim Heidel entertaining his two young daughters with a rousing game of paper football while stranded in a California snowstorm is a strange genesis for a sock company. Well, I suppose it is but maybe not. You see, Jim homeschooled his two beautiful daughters. A few years back Jim and the girls, Skyler and Kennedy, ages 9 and 7 at the time, found themselves stranded in a mountain cabin with their dad and one of our closest friends known as “Uncle Davie." The Heidel family was living in San Francisco at the time and his daughters loved everything about it. Davie was visiting from the road and planned to take them to a professional golf tournament outside of LA. They never made it. I can’t remember the story exactly, but there was an unexpected blizzard outside of LA that spring. I know that two overly energetic young girls and two 40 something golf bums had an overabundance of creative energy. Over that game of paper football, they all came up with the idea that it would be great fun and highly educational to sell socks on the streets of San Francisco and take the profits and donate them to the homeless of the city. We'd always done tie dye with our children from a very young age so the folk art part of it was a natural! I think they must have talked about it all night. They made the company's first purchase of materials the next day. $62. They parlayed the idea into a long project complete with balance sheets and income statements. They walked the streets of San Francisco selling socks and singing..."Get your tie dye socks here… three to a pair..."
Some years later, Jim approached me with the idea of making the idea more than just a good memory. I already new of the beautiful look, feel and environmental qualities of bamboo fabric. I produced some bamboo tie dye socks for him that really knocked his "socks" off. He wrapped his feet in bamboo and nothing else ever since. 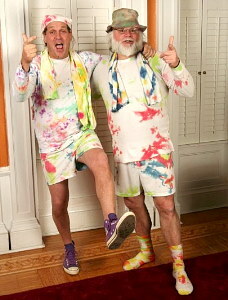 Now, eight years after that infamous snowstorm and paper football game, all of us at The San Francisco Sock Company are providing a unique selection of tie dye socks and other bamboo clothing to the world.